What some Jewish Groups are “demanding” now. In reaction to the comments, and the subsequent uproar they caused, the White House released a statement distancing itself from Gutman’s words: “We condemn anti-Semitism in all its forms, and that there is never any justification for prejudice against the Jewish people or Israel,” read the statement, which was sent out over the weekend to Jewish leaders. But Republican presidential candidate Newt Gingrich joined those arguing that a verbal rebuke was not enough. “Pres Obama should fire his ambassador to Brussels for being so wrong about anti-Semitism,” Gingrich tweeted on his account. Gutman, a lawyer by profession, was appointed ambassador to Belgium after raising major funds for Obama’s 2008 elections campaign. Filed under Uncategorized by Father Dave on Dec 4th, 2011. Comment. Israeli ministers have hit back at concern expressed by US Secretary of State Hillary Clinton that democracy is being eroded in the country. She criticised recent attempts by the centre right-wing coalition to restrict donations to non-government organisations. And she said attempts in some parts of Jerusalem to separate men and women on buses was “reminiscent of Rosa Parks”. Finance Minister Yuval Steinitz said she had “completely exaggerated”. 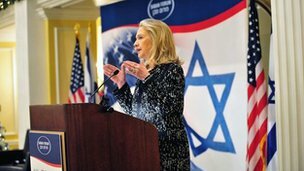 Mrs Clinton made her comments in a closed session of the Saban Forum in Washington, attended by both Israeli and US decision-makers. In front of an audience that included Deputy Prime Minister Dan Meridor and opposition leader Tzipi Livni, she made specific mention of legislation that proposes to limit funding to non-governmental organisations (NGOs), Israeli media reported. She also expressed her shock at incidents pointing to a growing discrimination against Israeli women. This included separate seating areas for women on some Jerusalem buses, which she compared with the 1950s era of Rosa Parks, the black American woman who refused to give up her bus seat for white passengers. She said the case of some IDF soldiers who refused to remain for a performance by female singers was reminiscent of the situation in Iran. Tzipi Livni welcomed Mrs Clinton’s comments. “Friends and admirers of Israel from within and without are worried about processes that Israel is undergoing,” she said. Environmental Protection Minister Gilad Erdan said “elected offcials should concentrate on what is happening in their own countries.” However he added that he shared her concern over the rights of women. Filed under israel and palestine articles by Father Dave on Dec 5th, 2011. Comment. It’s knowing the truth that will make all of us free. AIPAC and CUFI are playing hardball. So must we. Thanks to my neighbor, George, a retired Professor of Accounting, for sharing today’s video. As Germany’s Otto von Bismarck might well have said, “People are generally happier when they don’t know how sausages and laws are made.” Well, perhaps Americans have been too happy for too many years. Ignorance (not knowing) may be bliss, but ignorance doesn’t solve our country’s problems. Neither does apathy (not caring). All of us know the story of Capitol Hill’s most notorious lobbyist, Jack Abramoff. Abramoff was born in Atlantic City, New Jersey into a wealthy and prominent Jewish family. We all admire the work of Lesley Stahl at CBS News. Lesley was born in Lynn Massachusetts of Jewish heritage. This interview is an eye-opener: The Lobbyist’s Playbook – 60 Minutes – CBS News (14:53). The video won’t console you, but it might challenge you to help find ways to remedy the problem. There’s a postscript. P.S. Peers, you will notice that Leslie uses the word rationalization in this interview. Freud taught that the ego defense mechanisms are altogether “unconscious”. Holy and Universal. Local and Ordinary. Where daily Life unfolds. Have you noticed? A true story is more engaging than fiction. It’s more important, too. Please read Joharah Baker’s latest essay pasted below. Joharah is writing about real life and flesh-and-blood people, and neither Shakespeare nor Tolstoy nor Homer nor anybody in Hollywood could write a story as intricate, as multi-faceted, as complex, as painful and as wonderful as the epic that’s unfolding in the Holy Land today. Let’s all pay attention and we’ll learn a story that goes straight from God’s heart to yours. Let’s keep our eyes on the big picture while we pay careful attention to the details. We Human Beings have been given choices. It’s a matter of life or death. Let’s all of us choose LIFE. Please read on and you’ll understand what I’m talking about..
Everyone is hoping for Palestinian unity. The years-long political split between Hamas and Fateh has been devastating at more than one level but mostly at the level of Palestinian cohesiveness and lack of one united voice. This coveted reconciliation is close at hand – or at least that is what the leaders of these two factions would have us believe after all the fanfare surrounding their meeting last month in Cairo. And the people, perhaps beyond their better judgment, have raised their hopes that the Palestinians are finally coming together. While there is ample criticism of the performance of both sides, Hamas right now seems to be pushing its luck with its people. Having been isolated for so long in the Gaza Strip, it either has developed a false sense of popularity where it thinks whatever it does will be accepted by its people, or it is riding the wave of the moment, what with the Islamist movements sweeping newly democratic Arab nations. What Hamas has forgotten, however, is that the Palestinians relish in their democratic and secular political reality. So, when Hamas authorities close down a social media conference in Gaza, on grounds that the organizers did not obtain the proper licenses, this does not sit well with many Palestinians, whether in the West Bank where Hamas does not have a strong foothold, or even in Gaza. If anything, Palestinians everywhere are sick of oppressive authorities that try to control their every move, stifling even the most innocuous acts of personal freedoms, such as women smoking water pipes in public for example. Besides, according to Mohammed Abu Sharkh, one of the conference’s organizers, the group had sent Gaza authorities a request and had been given approval, only to be raided the day of the conference and told to shut it down. One stipulation of the reconciliation agreement is to hold presidential and legislative elections by next May. And this is when Hamas’ popularity – real or imagined – will show itself. So far, both sides think the elections will be a shoe-in. Fateh veteran Azzam Al Ahmad is already boasting about how Fateh will win the upcoming legislative elections despite the Islamist victories across the Arab world. Contrarily, this may be exactly what Hamas is banking on – that the rise of Islamic movements in the newly-minted democratic countries of Egypt, Tunisia and Libya – is a kind of guarantee that the same will happen in Palestine. If so, Hamas may be betting on the wrong horse. Palestinians, since the inception of the PLO in 1965, have espoused a secular philosophy for their liberation and have prided themselves on their respect for political plurality. It is only in recent Palestinian history that Islamic trends have been able to maintain a hold on the Palestinians in the manner that we have seen over the past few decades. It is hard to say whether the reasons behind this new trend are due to an actual shift in the Palestinians’ ideologies which moved them closer to political Islam or whether it is a reaction to the failure of other political movements. the ballot boxes. But if Hamas continues to oppress the freedoms of Palestinians – freedoms which they have worked hard to achieve and will not easily relinquish to a dictator regime– they will find themselves in the minority yet again. We all want national unity, no doubt. But we also want a Palestine where our individual and collective liberties are not trounced on by a totalitarian regime that wants complete control of its populace. Shutting down a media conference or a conference on women’s labor rights in Gaza will not win Hamas votes – at least not from a large sector of our society. Embracing national unity and the principles upon which the Palestinian revolution were founded – including political and religious freedoms –undoubtedly will. Joharah Baker is a Writer for the Media and Information Department at the Palestinian Initiative for the Promotion of Global Dialogue and Democracy (MIFTAH). She can be contacted at mid@miftah.org…. Michelle is reading her e-mail at the White House breakfast table and smiling quietly. President: What does Dante have on his young mind this morning? Michelle: Hon, Dante has written you a Thank You Note. President: Really? What’s he thanking me for? Michelle: He’s thanking you because he read the article from Maan News Agency which is pasted below. President: Why don’t you just tell me what he’s thanking me for? Michelle: Well, it’s a sensitive matter. President: Okay. I’ll glance at the headline now and read the article later. Michelle: Dante invites your attention to this video: Hisham B. Sharabi Memorial Lecture (38:23). He says you’ll find it existentially encouraging and ontologically “confirming”. President: Confirming? Really? What’s it about? Michelle: Hon, you’ll have to watch the video yourself. I’ve watched it, and I suggest that you watch it this morning. President: Who’s featured in it? Michelle: You’ll see. I’ll give you a hint, tho. You know him. President: Okay. What else does Dante have to say this morning? Michelle: Dante says he admires the way you’re networking with other Leaders of the Free World to resolve the conflict in the Holy Land. He mentions the Quartet and the way you’re working in tandem with Angela Merkel, for example, to outsmart Benjamin Netanyahu once and for all. He says that he and his Allies on AOL approve of your overall strategy. Some of the subtleties of your strategy are now being reported in Israeli media. President: What’s he talking about? Michelle: This article from Ha’aretz will explain: Israel concession on Palestinian funds forced by German submarine deal. But I suggest that you read the article pasted below now, because that’s the one that prompted Dante’s Thank You Note. The highlights are his. WASHINGTON (AFP) — President Barack Obama’s administration rejected Republican calls to fire the US ambassador to Belgium after he said that the Middle East conflict was partly to blame for anti-Semitism. “We have full confidence in him,” State Department spokesman Mark Toner told reporters. He said that Gutman, a political appointee and longtime fundraiser for Obama’s Democratic Party, was expressing his personal opinion. “The ambassador’s comments demonstrate the Obama administration’s failure to understand the worldwide campaign to delegitimize Israel and its appalling penchant for undermining our close ally,” Romney said. “The president has been as supportive, if not more supportive, than any president in American history,” Kerry told AFP. Last week, Defense Secretary Leon Panetta demanded that Israel “get to the damn table” for peace talks and Israeli ministers reacted angrily after Secretary of State Hillary Clinton was quoted expressing concern over the future of democracy in Israel. Filed under israel and palestine articles by Father Dave on Dec 6th, 2011. Comment.